As pointed out in the Department of Education (DepEd) Order No. 35, series of 2014, the collection of data and information needed for planning and budgeting, allocation of resources and setting operational targets is to be worked on by both public and private elementary and secondary schools. In so doing, this is to keep the Enhanced Basic Education Information System (EBEIS) improved. Thus, "complete quality basic education"is facilitated and realized. 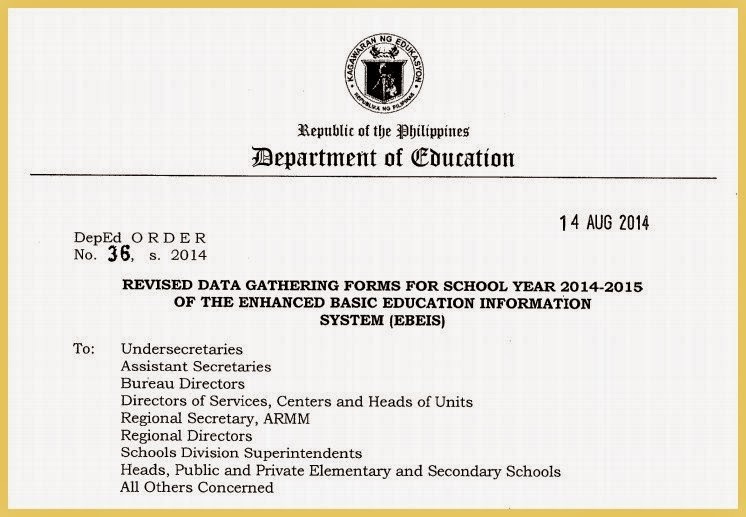 Therefore, all heads in public and private elementary and secondary schools are required to submit via online the data on EBEIS for the end of the school year 2014-2015. This features the automatic transfer of enrollment figures entered in the Learner Information System (LIS) to EBEIS and they tally on Tables 1 and 2. The school heads/teachers-in-charge of schools, public and private, are the persons responsible in accomplishing EBEIS data gathering forms to its promptness, completeness and accuracy. 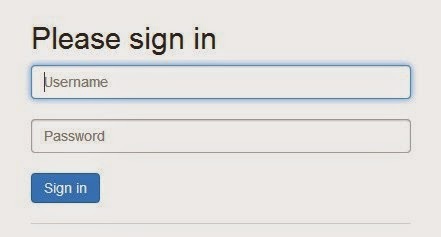 1.Log in to LIS site using the School head's username and password. With a successful access, SH's name is displayed as logged in as School Representative with corresponding name of school. 2. 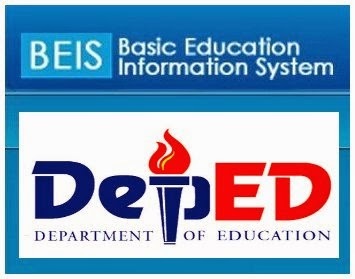 Click the box labeled "Basic Education Information System" and click "Sign In" button. 3. Click BEIS Data Entry. Select appropriate items below to be updated. Since you're to encode the beginning of the school year info, click it. 3. 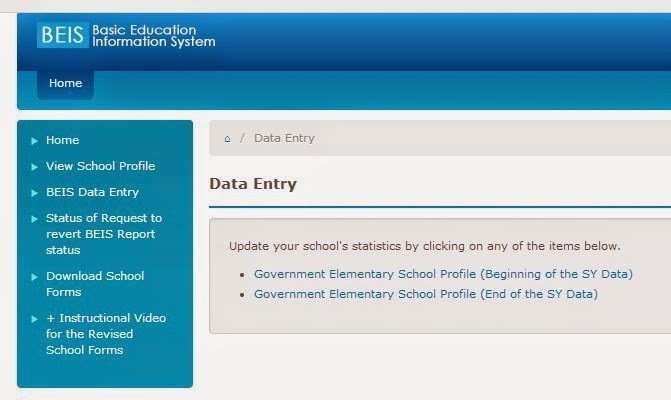 Click Government Elementary School Profiles (Beginning of the SY Data) to update it then click edit. 4. At your basic information, supply those item with asterisk with the appropriate or correct data. Then at the bottom, click save. 5. Proceed to other items until you're through. Note. After you're done, check your data entry, your status will be displayed like "prepared". Any error on data, you will be prompted and told on what to do. Good morning Sir! Our school address in not correct, how can i change it when that particular cell can't be edited? 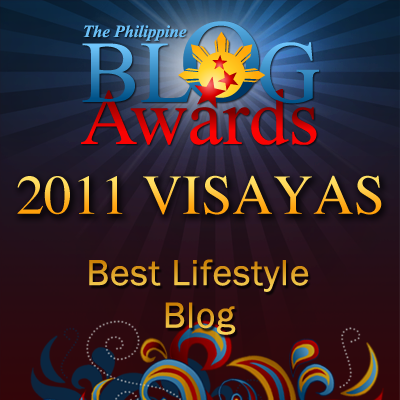 ours is Cabangan but in the beis is Cabaga'an. I think you should contact your division planning officer to effect the correct data. Only boxes that are with asterisk could be edited. Aren't they? 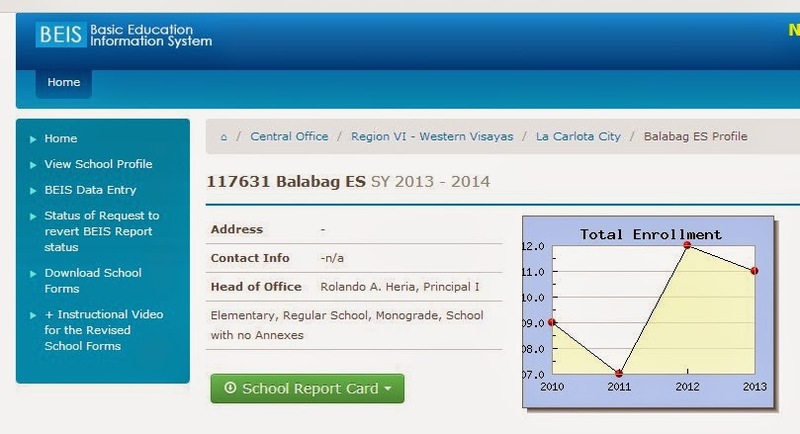 Hello sir,ano puh kaya pwede naming gawin sa lis kc puh ung isa naming fourth year hindi puh nagrereflect yung no.of students kasi puh nailagay nmin na non-graded sir... 583 po nasa lis pagdating puh sa beis 528 nlng puh...sir pahelp puh...salamat po.